Remember that one of the emphases of Acts is evangelistic mission as well as to portray the authority and importance of Christianity. The passage that we read continues Peter’s “Pentecost Proclamation” that we began last week. That read appeals to the Jewish listeners to listen and consider the witness to “Jesus of Nazareth”. The idea of them being “cut to the heart” implies that they got the message and maybe even realized their own shortcomings or perhaps their own guilt over what had happened. Their question of “What shall we do?” is possibly rhetorical, but it makes a sincere request for instruction that will lead to forgiveness and restoration. Peter’s response to “repent, and be baptized…” is essentially repeating John the Baptist’s early directive that we hear in The Gospels. But the context is, of course, very different in this Post-Easter and Post-Pentecost time. Here, “repent” means a reorientation, just as it did for John the Baptist. It means looking at the world differently and then being gifted with the Holy Spirit. Here, Baptism is not just individual repentance but initiation into the faith community, which we still assume today in our sacrament. So, after Pentecost, Baptism initiates believers into a spiritual reality that John the Baptist could only predict. Prior to Pentecost, the community’s membership stood at one hundred and twenty (Acts 1:15) and now it stands at over 3,000. The community at this point has become a strong public presence in Jerusalem that will now be noticed by outsiders. Now, keep in mind that these were still mostly Jewish converts at this point. (In fact Peter himself would have been a Jew among other Jews.) They understood repentance (teshuva) not as some magical “born again” experience, but an act of one’s intelligence and moral conscience. It was more than merely confessing sins; it was changing one’s life and resisting and desisting the sin altogether. They also would have understood it more in terms of community than an individual penance before God. Think about the person delivering this message—Peter was the one that denied Jesus and then stood at a distance to watch the execution and now he is preaching a message of repentance. Based on this passage, we essentially live within the “end-times”. The potential of Easter on our lives has begun. This is a calling to claim our existence as the church of Christ. Does that differ from our own interpretation of being “born again”? What does that mean for you to live within the “end-times”? How would we react to this message of Peter’s in today’s world? Remember that First Peter is one of the general (or catholic) epistles, so the “you” addresses a collective “you”, rather than a specific group of people. In the passage that we read, the claim that God is “Father” is directly related to the call in v. 14 for the readers to be “obedient children”. It is a reminder of God’s gracious relationship to the Christians and the call that they have to responsible and faithful living in the light of that relationship. The “exile”, here, probably refers to that time of waiting for the full revelation of Christ (which the writer and most of the readers or hearers would have assumed to be right around the corner.). “Living in exile” could mean simply living within a context into which one does not fit. The letter is to “the exiles of the Dispersion”. Exile may or may not be a matter of geography. It just means being out of place. And being out of place can alienate or it can draw a community together. The writer was calling the people to the latter. God’s holiness requires Christian holiness for relationship. The reminder that Christians have been “sprinkled with Christ’s blood” is the initiation into the faith and obedience. Here, too, the time in which believers live is the “end of time”, but Christ has been known since the beginning of time. This letter is meant as a letter of encouragement for new Christians who may be faltering but who are destined to be God’s people from the very foundation of the world. They were destined to be redeemed. So it is essentially a call to “fear” of God, a call to being awe-struck by what God has done in one’s life. Obedience is a major concern of this epistle. For the writer, faith shows itself and hope realizes itself through obedience. We tend to think of this as following some list of rules. What it really means is learning how to “be” a disciple. It is being who you are called to be. What does the call to “fear” or “revere” God mean to you? This passage is essentially a call to obedience. What does that mean to you? What does it mean here to be “born anew”? This is a familiar story, but it’s got so many profound meanings to it. Here are just a few points to consider: First, the village of Emmaus—this was a no-name village. It still pretty much is. There is a site that is assumed (just assumed) to be Emmaus that really is not very big at all. And then someone approached them. You can bet they were a little wary at first. “What are you talking about?” the stranger asked. “Good grief,” they must have thought. “Where has he been? I mean, EVERYONE is talking about it.” So they told him the story of Jesus—at least they way they thought they understood it. And then this stranger began to interpret things to them. Who was this? And that evening, as they all sat around the table together, this stranger picked up a piece of bread, blessed it and broke it. And as he handed it to them, they saw who it was. Seven dusty miles and it was not until this moment that they saw what they almost missed. They could not wait to tell others. The Lord has risen indeed! For these two disciples, none of this day was planned as a sacred moment. But somewhere in that act of sharing bread with a stranger they saw the Christ. And then…he was gone. Because you have to remember that God’s presence is always a bit elusive for us humans, always dancing in and out of our awareness. The mystery of God’s transcendence is never static or predictable. But in the midst of our ordinary and sometimes mundane lives, we are given glimpses of the holy and the sacred. They come without warning. They come without bidding. Sometimes they come when we’re not quite ready, maybe even when it’s a little inconvenient for what we’ve planned in our life. But life is not just about those pinnacles of holy sightings. If we spent all of our lives on the mountaintop, we would certainly get a bit of altitude sickness. Life is an ordinary road on which we travel. It’s got hills and valleys and a few potholes along the way. And every once in a while, holiness enters and dances with us. And then we must return to tell the story of what happened to us on the road to somewhere else. But the point is that Jesus appeared in both places—the place that we go to retreat from the world and on the road itself. Jesus appears in the ordinary and the sacred; in the mundane and in the special. And if we don’t recognize the presence of the Risen Christ, the presence waits around until we do, even continuing to give us clues until we catch on. 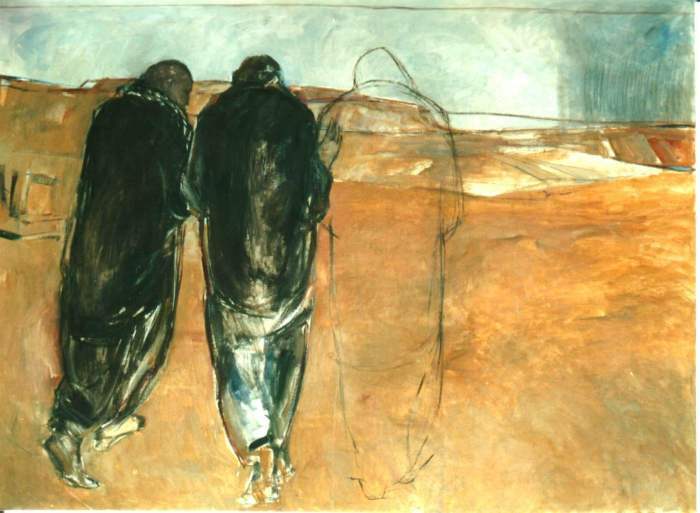 Then, there were two people on the road—Cleopas and “the other one”. Now Cleopas is not that well known. He is not mentioned in canonical Scripture again. Church tradition claims that he was the father of one of the disciples and/or the husband of one of the women at the cross on the day that Jesus was crucified. Eusebius, the 4th century church historian claims him to be the brother of Joseph of Nazareth, which, I suppose, would make him Jesus’ Uncle Cleo! It really doesn’t matter. It’s the “other one” that should concern us. Usually when there is no name given, then the “other one” is us. And another thing to consider is that maybe the “unknown” characteristic of the town matters too. Maybe the message is that its not about the destination, but about the road itself and the way we encounter the Risen Christ on that road. The point is that life is ordinary, with hills and valleys and a few potholes along the way. And in the midst of the ordinary, the holiness of God dances in and out of our lives. But the gift of holiness is not private. It is something to be shared. It is something on which we are invited to feast. So, upon seeing Jesus, they returned to Jerusalem to spread the news. What is that “place” to which you retreat? Where do you see yourself on the road? How aware are you of the holiness dancing in and out of your awareness? What gets in your way? During Eastertide, we read from the Acts of the Apostles, rather than the Old Testament. Similar to the story of how the Hebrew people united to be the people of God and the people that they were, Acts provides the earliest account of the disciples uniting together in the face of Christ’s Resurrection and how the church as the Body of Christ came to be. The book began as a written conversation between a storyteller (Luke) and his story’s first reader (Theophilus). It is actually, though, considered an anonymous book. Even though the church traditions give credit to the evangelist Luke for writing both the third Gospel and Acts, there is no real evidence either way. If you read Acts for Acts, then the identity of the author is really of no importance. The focus for the writer and the focus for us is on the story itself. According to the writings of Acts, it seems that those who had been with Jesus did get on task pretty quickly and suddenly turned into witnesses rather than limiting themselves to being followers. This passage is part of Peter’s “Pentecost Proclamation”. You can hear the excitement in the voice of the writer. There really is a desire to get everyone on board, to let everyone see what the witnesses have seen, what the witnesses now know. The problem is that with most of us humans, there’s always a “but”, an excuse, a really, really, really good reason why we can’t fully commit to what God is calling us to do. At first reading, it seems that there exists a strong belief here in the notion of Jesus’ death being “pre-ordained” by God. I’m not so sure about that though. If God did “pre-ordain” Jesus’ crucifixion, does that also mean that God “pre-ordained” the Crusades, the Holocaust, and the terrorist act of September 11, 2001? I mean, where does it stop? Whatever happened to free will? Are we just pawns in some great divine chess game waiting for God to move us to the next place? I have to tell you, that’s not my image of God. As the Scripture says, I think God actually DID intend to hand this God Incarnate over to us, to give up a piece of Divine control, to invite us to respond to this incredible act of God literally walking in our midst. Think about it…you know how you take that favorite jacket to the dry cleaners? Life is not designed such that you can stand there and watch them check it in, go through the dry cleaning process, and hang it back in its environmentally-unfriendly plastic bag (yes, that was a little bit of a dig! ), all the while making sure that it is properly tagged and identified and gets to where it needs to go. No, the truth is, you hand it over to the cleaner. Now, at the risk of comparing the Son of God to a really cute jacket, God handed over the human part of God to us. God relinquished control. It was up to us. But…but we messed up. No excuses this time! We royally messed up. We didn’t like change; we didn’t like being told that the way that we had figured out how to live was not the right way; and we didn’t like the idea that we could no longer control our own destiny. So, we killed God. We lost the Divine in our midst, if only for a moment. BUT…”God raised him up”. BUT God stepped in and found what was lost, redeemed what was gone, and made alive what was once dead. THAT is what we are called to witness–not that something awful that God had supposedly “pre-ordained” happened, but that God had “pre-ordained” handing the very Godself over to us. And when we didn’t respond the way we should have, God stepped in yet again–not to punish, not to “undo”, but to take the worst of humanity and recreate it into the best of God. Now, my friends, THAT is a good story. THAT is something to which we can witness! This is the season when God shows us how to be more than followers, how to be witnesses and doers, how to BE Christ in the world…no “buts”…we really are supposed to do it! What is the difference in this interpretation and the one that says that God “pre-ordains” participating with humanity in life? What do either of those notions say about one’s understanding of God? First Peter is considered to be one of the general (or catholic) epistles, along with Hebrews, James, 1,2,& 3 John, 2 Peter, and Jude. They are not attributed to Paul and they are not addressed to a particular church but to a group of churches (catholic). First Peter speaks to the condition of the churches across the traditional lines of time and place. It has provided comfort for believers in troubled times from the end of the first century to the present. Using the imagery of baptism, it provides a reminder for the baptized of what it means to live out of the sacrament and to live out the sacrament in their lives as individuals and as a community. The passage that we read includes praise for God for the ways in which Christians have been elected and redeemed. The term “new birth” refers to the new life received through Christ’s Resurrection. Being “born anew” does not refer to a specific spiritual experience, but, rather a radical rebirth through the Resurrection. The Resurrection of Christ provides hope for the future and strength for the present, according to the reading. Another theme represented is the idea of belief without seeing, or, actually, faith. It is by faith that we provide hope for our future and joy until then. This letter was first written to people who were going through some really tough times, possibly people who were suffering because they WERE who they were. They are not being promised a quick fix. In fact, there’s a possibility that this is just not going to get any better at all. Faith is not believing that God will fix it; faith is believing that there is always something more, something beyond what we know, something beyond even this. What does the concept of being “born again” mean to you? What does this passage say to you about faith? How does this speak to you about suffering? This passage occurs as a text for both Easter and Pentecost in the church’s lectionary. It reminds us that the seeing of the risen Christ is also the gift of the Spirit that begins our Christian journey. 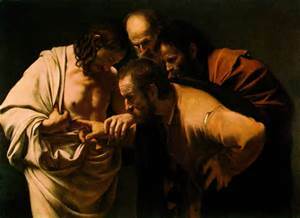 The second part of the passage is usually referred to as the story of “Doubting Thomas”. In essence, this really sort of falsely isolates Thomas from the rest of the disciples (and perhaps even us!) The center of this story, though, is Jesus, rather than Thomas. It is the story of Jesus giving Thomas what he needs—the generous offer of himself. It says that, for Jesus, Thomas’ faith is more important than the grounds on which it is made. (In other words, HOW we got our faith is insignificant in the face of our faith, itself.) There is a fine line drawn between what Thomas needs and what Jesus offers. (Thomas needs what Jesus offers; Jesus offers what Thomas needs—the two are interchangeable—neither really came first.) So Jesus’ love for his own did not end with his death, but determines all future interactions between Jesus and the community of believers. It is a story of hope and promise, rather than a reprimand of unbelief. Jesus loved Thomas enough to do what needed to be done so that he would get it. Hans Kung said that Doubt is the shadow cast by faith. One does not always notice it, but it is always there, though concealed. At any moment it may come into action. There is no mystery of the faith which is immune to doubt. Isn’t that a wonderful thought? Doubt is the shadow cast by faith. Faith in the resurrection does not exclude doubt, but takes doubt into itself. Faith is a matter of worshipping and doubting, doubting and worshipping. It is a matter of being part of this wonderful community of disciples not because God told us to but because our doubts bring us together. Examining our faith involves doubts, it requires us to learn the questions to ask. And it is in the face of doubt that our faith is born. God does not call us to a blind, unexamined faith, accepting all that we see and all that we hear as unquestionable truth; God instead calls us to an illumined doubt, through which we search and journey toward a greater understanding of God. We have a common saying that expresses our insistence on tangible proof of every faith claim: “I’ll believe it when I see it.” And just when will that be? I ask myself, as I read this passage about Jesus’ appearances to the disciples and then to Thomas. When will the moment come when we look up and really notice, really see the Risen Lord who stands before us in every room in our house, in every situation in our lives? He is, in fact, standing beside you right now as you read this. Have you noticed? The disciples were, John tells us, locked in their room “for fear of the Jews.” “The Jews” is John’s label for those among the religious leadership of the day who opposed Jesus. And, probably, code for those who opposed his community at the end of the first century. It doesn’t refer to all Jews of Jesus’ day and it certainly doesn’t refer to Jews today. I don’t take the disciples’ fear lightly. There was danger out there. Who knew whether the people who had killed their leader would now come after them? (Jn. 15:18, 19) Or whether they would be accused of having stolen his body in some resurrection scam? They were locked in their room with their fear and their grief. That was bad enough, but now Mary had to come and introduce a ridiculous hope into their grief: that she had seen him and that he had spoken to her. How could such a thing be true? If I had been there in that locked room, I would have been thinking “I’ll believe it when I see it.” But the fact that I was looking down would have made that impossible. I would have tried looking at the four walls and the locked door. But all they signal is fear and false security. I would have tried looking at my friends’ faces. But all they signal is grief and confusion. So I would have been looking down when the Risen Lord arrived. There is so much we miss when we’re looking down. We would miss our Risen Lord’s greeting. a) What meaning does this passage hold for you? b) What does this passage say, then, about doubt? c) Where do you find yourself in this story? That One Star lights the world. Let it begin with singing and never end! Oh angels, quit your lamenting! Oh, pilgrims, upon your knees in tearful prayer, rise up and take your hearts and run!